Our thoughts and prayers are with our California neighbors at this time. 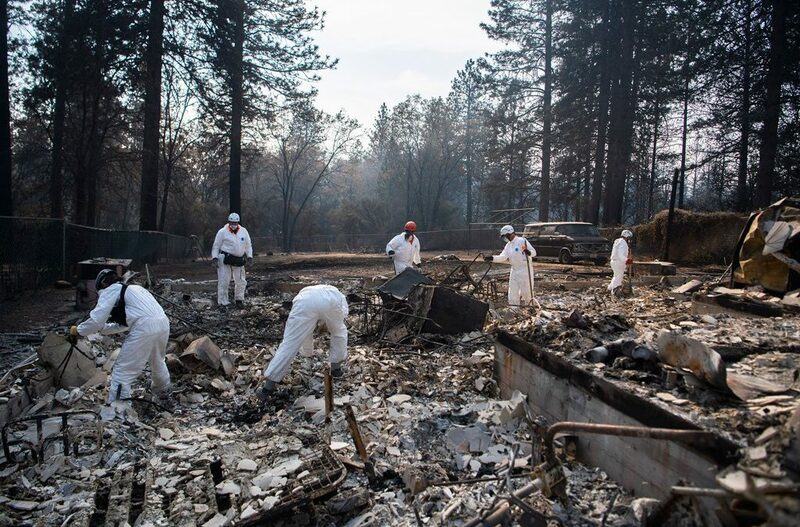 The story that stands at the top of a long list is the one about a woman who watched her father age 66 run back into their house during the Camp Fire. Then she watched the house burn to the ground. Folklore has it that the city of Paradise was labeled “Paradice” during the Gold Rush days after the “Pair O’ Dice” saloon. In the 1960s, when Paradise’s building boom began the roads built for miners would serve a population of 8,000 people, according to the LA Times, October 15, 2018. There are primarily four roads leading out of town all in a high-risk fire severity zone. Just 103 of over 11,000 parcels of land were not “very high” fire risk, according to the city’s planning department. Paradise did little to slow growth to 26,000 people in spite of several fires over the years. The town’s “planning council members in August, 2018, entertained a proposal to build a 56 unit senior living complex, taking advantage of state zoning laws that allow increased housing density for the elderly. The town projects 23% growth in the next 22 years,” found the LA Times. It is worth noting that the 2016 median age in Paradise, CA is 50, according to https://datausa.io/profile/geo/paradise-ca/. With median household income at $47,533 and median property value of $200,900, it was primarily a retirement community. What happened north of Sacramento could indeed be a view of what could happen in other communities as we age. Early Saturday, November 10, 2018, President John (Wayne) Trump threw the entire state of California under the bus with his blame, by tweet, that the California wildfires on “gross mismanagement.” Twelve hours later Trump tweeted support for our firefighters. Opinions are like belly buttons, everybody has one. So it would seem to be an informed perspective was provided by California Professional Firefighters Brian Rice who said in response in a statement on Saturday, “The president’s message attacking California and threatening to withhold aid to the victims of the cataclysmic fires is ill-informed, ill-timed and demeaning to those who are suffering as well as the men and women on the front lines.” Last year it was Mother Nature that showed up to unleash the worst fire in the state. Only to be topped by 2018. More than mismanagement, it is Mother Nature that holds the genuine trump cards. Construction companies, building supplies, and home appliances will likely enjoy a sudden demand for replacements, but the utility companies like Southern California Edison and Pacific Gas & Electric may see downward pressure on stock prices. Edison was found responsible for a downed power line that sparked the Thomas Fire in the wine country just a year ago, and it looks like it was two utility companies that sustained outages minutes before the deadly wild Camp Fire outbreak killing at least 58 people, with 300 people missing. County, near where the Woolsey Fire broke out Thursday. It wasn’t ‘land management’ as much as it was nature. It’s been all politics, all the time, for what seems like years. And it’s not over. We’ve got multiple recounts underway, and for those that live on a constant drip of political drama, the recount in Broward County, Fla., makes a compelling soap opera. South Florida, home of the “hanging chad,” should be the poster child for efficient polling after the 2000 presidential election. Apparently, that’s too much to ask. But the newly-elected House Democrats aren’t wasting time. Not that anything much changes. But while the nation is glued to the slow-moving train wreck known as national politics, the markets are venturing into ugly territory, selling off after rallying on the heels of an ugly October. The leaders of yesterday are exactly that, has-beens. Is it tariffs? Higher interest rates? Political gridlock? Cautious guidance? Slowing global growth? Falling oil prices? In a word, yes. It’s all of the above. Priced for perfection is so 2018. Positioning for 2019 looks like battening down the hatches. As observed here previously, the president of Indonesia at the October, 2018, IMF Conference in Bali declared, “Winter is coming.” So let’s prepare for a cold, hard winter, no matter who is U.S president, or which group controls the House and the Senate. The best thing we can all do, including the leaders of our country, is first remind us that we are here at the mercy of Mother Nature. Second, encourage us to prepare for disasters, as opposed to identifying false scapegoats to throw under the bus. As a Boy Scout, I learned a long time ago that Mother Nature and Father Time hold the actual trump cards. In the meantime, let the records show that George W. Bush began his presidency with $5 trillion of debt and finished his term with $9 trillion. Today the U.S. stands with north of $20 trillion of debt. This course is not sustainable. The pain of winter, primarily caused by man will not be missed. We enjoyed unprecedented quantitative easing. As the world prepares to see how we weather the medicine of quantitative tightening, do not get stuck watching TV. Savvy investors don’t need to see the future to prepare for it.